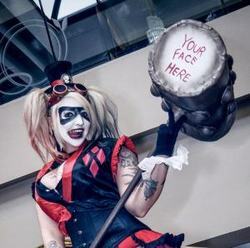 Candy Cosplay is an Artist / Cosplayer who has been cosplaying since 2007. She took her love of art and brought it into her cosplay, and has cosplays under her belt from anime and movies, to video games and TV shows. She loves showing her passion and love for cosplay as she's been in love with costuming since she was little. She loves seeing all the love and work people put into their cosplays, and meeting new people. She is most known for her take on Marvel's Lady Loki and her stunning Maleficent.